Copperleigh Trout Cottage - Dargle Accommodation. This establishment has been endorsed with the Superior Status by the AA. We are located 30kms from the town of Howick under the shadow of Inhlosane Mountain. At Copperleigh Trout Cottage, we are striving to ensure that you only have the best experience whilst staying with us on our fully functioning sheep and cattle farm. Our modern designs and comfortable rooms, along with great hospitality will give you a truly memorable experience. It is a fully equipped self catering cottage. Linens and bath towels provided (please bring your own swimming towels for the dam as they are not provided). Occasional housekeeping. Copperleigh Trout Cottage is an 8 sleeper unit. It has two comfortable bedrooms, able to sleep 2 adults in each of the queen size beds. These bedrooms are also equipped with ceiling fans, hairdryers, and electric blankets. The loft room is more suited for children and can sleep up to 4 and features a bunk bed as well as a double sleeper couch. The bathrooms have complimentary soap and shampoo. Free wifi is also included, entertainment provided by DSTV Premium satellite service, along with a large movie collection, boardgames and more. The enclosed fireplace is a favourite with our guests and a large complimentary bundle of firewood is provided each day (should you require more firewood during your stay, bundles can be purchased from management). Please bring your own charcoal for the Weber braai. There is lots to do on the Midlands Meander routes close by, such as horse back riding, go-karting, tasting amazing cuisines, hiking, fly fishing, shopping and more! Weekends are very popular. We are close enough to Durban for you to escape the hectic city life without traveling far. Minimum 2 Night Stay over weekends. Stay over Christmas or New Year holidays, Midmar Mile or Easter is also a great time to escape the crowds. Don't be stuck at home, come and enjoy the glorious outdoors and fresh air whilst relaxing on our fully functioning sheep and cattle farm. Children can hold and interact with baby lambs (depends on season), or go swimming or boating on Mavela Dam, walk on the farm, hunt for eggs in the chicken run, or you can relax at the cottage with board-games, a large movie collection, DSTV Premium or a good book. Fly fisherman will enjoy Mavela Dam (stocked annually with trout by the Natal Fly Fishers Club), which is accessible right from the cottage. Keen birders will also find our diverse bird life a real treat. We have Fish Eagles, seen the rare Wattled Crane (including chicks); Grey Crowned Crane; Blue Crane; Spur-winged Geese; Yellow-billed duck; Herons; Spoonbill and many other aquatic birds are just some of the amazing bird life we have. There are also other wildlife which come onto the farm and can be seen from time to time including: Reedbuck, Bushbuck, Water buck, Duiker, Oribi, Serval, Otters and more. **Please note that we are a non-smoking establishment. No pets allowed. No large events or loud parties. * From the N3 highway near the town of Howick in KZN, take the Howick/Tweedie exit and turn left to head away from Howick towards Lions River (R107). * At the T-Junction (R103), turn right. Continue straight, drive through the small town of Lions River, head over the bridge which crosses the Lions River, then look for the Dargle/Impendle (P134) road on the left hand side, and turn left. If you see Piggly Wiggly shopping area you've gone too far. * Continue on the Dargle/Impendle road (P134) for +-20km, do not turn off anywhere. * Eventually the tar will merge onto a gravel road (P130). Continue for another 7km. * Look out for the Boston/Everglades turnoff, turn left onto that road (P132). * Travel another 500m and look for the 'Copperleigh Trout Cottage' signboard on your left and turn in there. Continue down the driveway until you see the cottage. 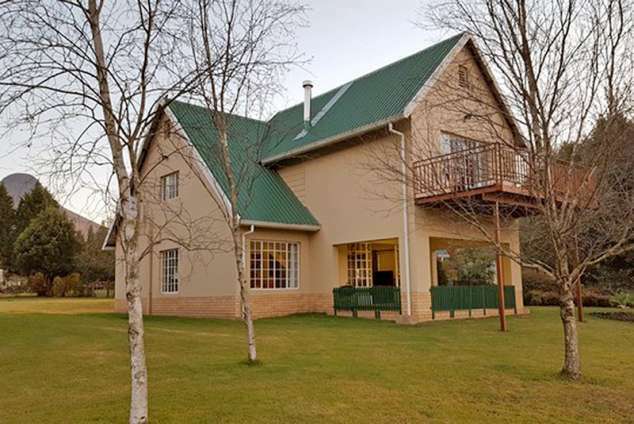 Detail description : The cottage is very private and overlooks the 10ha trout stocked Mavela Dam which guests have free access to. Inhlosane Mountain provides a stunning backdrop. The popular Midlands Meander attractions are close by. 812 page views since 16 Jul, 2018.